L-R: OFC President and CONMEBOL President Alejandro Dominguez sign the Memorandum of Understanding between their two Confederations. The Oceania Football Confederation (OFC) has signed an important Memorandum of Understanding (MoU) with the Confederación Sudamericana de Fútbol (CONMEBOL) in Auckland, New Zealand. 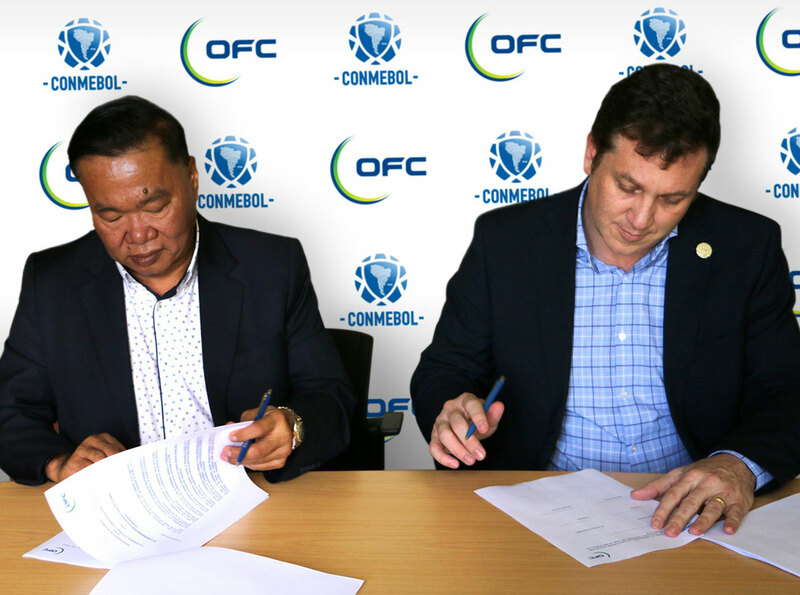 The signing ceremony formalises the cooperation between OFC and CONMEBOL, establishing a framework to strengthen collaboration and encourage knowledge exchange. “This MoU represents an important step for Oceania as we continue our efforts to advance football across the region,” President Chung said. “Not only are we strengthening the bonds with our South American friends, but we are facilitating increased opportunities for football exchanges for our respective Member Associations and their national teams. CONMEBOL President Alejandro Dominguez said: “We are delighted to reach this cooperation agreement with OFC. “As the first Confederation that was founded, CONMEBOL has a rich history with over 100 years of experience to offer the world so as to promote football’s continued development. The MoU was signed by President Chung and President Dominguez at the OFC Academy in Auckland, New Zealand following a visit to the OFC Home of Football in Saint Johns. President Dominguez and his delegation are in Oceania to attend the Leg 1 of the Intercontinental Play-off between New Zealand and Peru at Westpac Stadium in Wellington on Saturday 11 November.